When I read the synopsis of this book, I knew that it was a book I'll enjoy. Thankfully, that exactly happened. 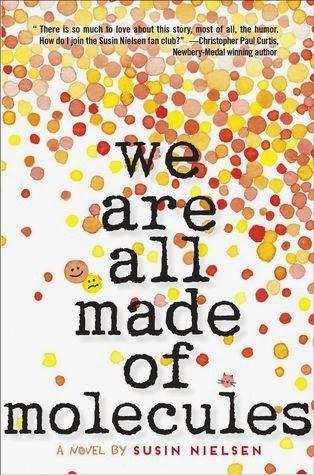 I truly loved and enjoyed this book, despite the fact that it might have been middle grade. 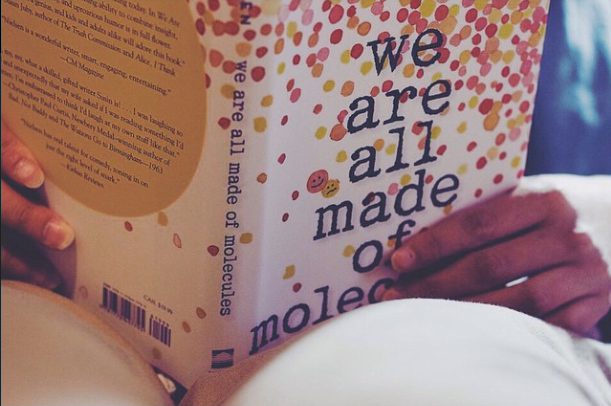 We are All Made of Molecules is a book told from dual POV's, Stewart and Ashley. Stewart is a young gifted boy, who by the way happens to have a great sense of humor, and Ashley is about two years older than Stewart, and one might say that she's a mean girl. The thing that brings these two opposite different people is their parents. Stewart's father happens to be in love with Ashley's mother, and the decision to move in together happens. While Stewart, being the cute optimistic bright child he is, is happy to have a sister, Ashley isn't quite thrilled. Ashley is the type of character that seems annoying, and she also happens to be in that bratty teenage stage where nothing matters but her social status. Therefore, when two complete opposites are placed in one household, it was interesting to see how these two distinct character mesh together. Personally, I really liked Stewarts voice and personality. He is a very smart kid, and we're reminded that with every sentence that comes out of his mouth. Even when he's not purposely trying, smart sarcastic remarks ooze out of him all the time. Ashley, on the other hand, was this annoying kid I just wanted to shut up. She really was selfish, and was extremely rude to Stewart, his father, and even her own mother. She acted like everyone did this on the sole purpose of making her life miserable (therefore, you can understand how self-centred she is). 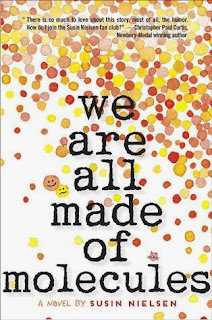 I don't want to spoil too much, but this book kind of felt like the movie Yours, Mine, and Ours where two opposite families are combined, where the results tend to be very funny, if you ask me. Plot wise, the story was much more than just two kids not enjoying the fact that they have to live in the same household. There is a lot that can be learnt in this book, such as dealing with loss, friends, family, and people in general. Because of that, it was very interesting to see how the characters (especially Ashley), changed to be. Susin definitely created characters that really felt real, and not two dimensional. Like I stated before, I honestly do not think this book would be childish to all you young adults out there. I'm nineteen, and I genuinely enjoyed this book from start to end (Also, this book started off in such a hilarious way, I knew I'd end up loving it). We Are All Made of Molecules was just one of those books that I closed with a big grin of my face, happy with how it ended but sad to let the characters go. Thanks for the review, I have been planning on starting with this book, but I just needed a little bit more motivation, which I found in your review. The book really sounds promising. Stewart sounds absolutely adorable! I can't wait to meet him. :) And I'm sure it would be really engaging to read about how Ashley develops throughout the novel. Fantastic review, Farah!